I have a new to me indie brand to share with you today. Keep in mind, this brand isn't new, it's just new to my stash! I was perusing Black Cat Lacquer's website a little while ago and saw quite a few polishes that caught my eye. I ended up receiving a few in a recent gift exchange, and have been really impressed with them. This is one of the ones I received. 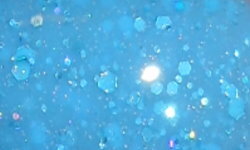 Artemis is a sky blue crelly (creme + jelly) base with pastel blue holo glitters. Color: I find crellies like this harder to find. It's easy to find very pale or white crellies with contrasting glitters. I love the monochromatic look of this medium toned blue with similarly toned glitter. It's not a subtle at all like you might think. It's a beautiful glittery polish. This shade of blue is perfect too. Formula: Excellent and superb formula. I typically have application and formula issues with crellies. This was a breeze. This applied so easily, and I had no trouble getting the glitters on my nail. This was a perfectly blended and balanced nail polish. Price: This is $9.00 on the Black Cat Lacquer website. Overall: Artemis is an excellent polish. I love the color and look of the glitter. I don't make my way around many indies, and this is one I'm so pleased I have tried. I am very impressed with all aspects of this polish. Black Cat Lacquer is a definitely a brand I will be re-visiting! I love this color! I have several BCL's and they are all really nice!